If you’re looking for a quick weeknight meal that’s both light in calories and easy to make, this is your dish! 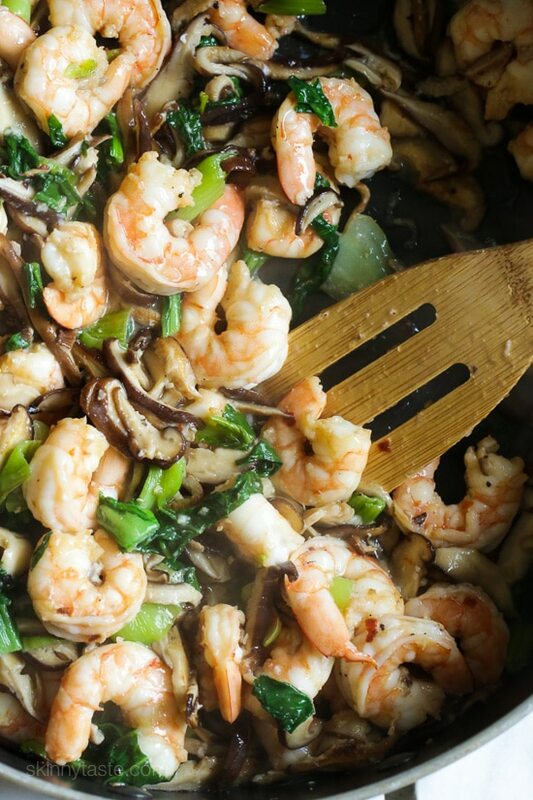 It’s also naturally gluten-free and perfect for Whole30 or Paleo diets since this stir-fry recipe has no soy-sauce. This recipe is slightly adapted from the cookbook Plated: Weeknight Dinners, Weekend Feasts and Everything in Between. You may be familiar with their food deliver company where all the ingredients get delivered right to your home. Well, the culinary team behind the scenes, Elena and Suzanne created this cookbook to give their customers recipes to cook anytime. I attended a dinner for the launch of their book where we all got to create seasonal salsas for an amazing shrimp taco dinner (recipes also in the book) complete with a wonderful panna cotta dessert. 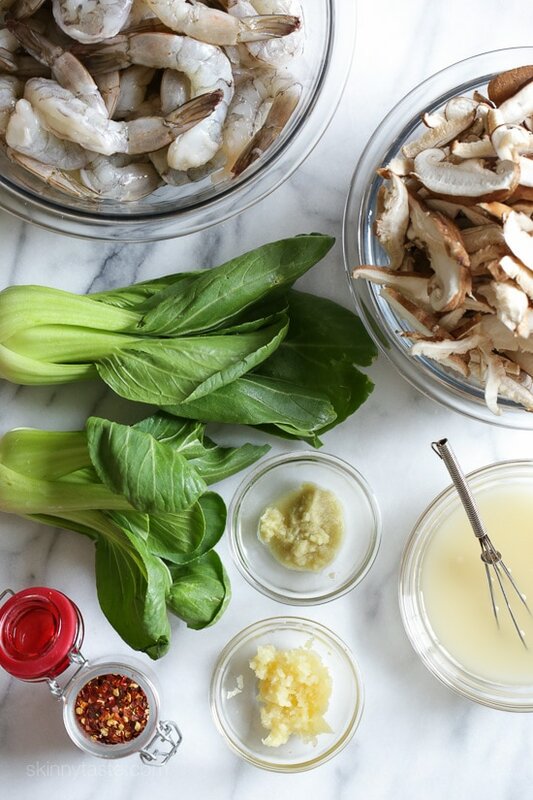 Cut the bok choy crosswise into 1⁄2-inch slices, keeping the leaves and stalks separate. Mince the garlic. Stem the shiitakes and thinly slice the caps. Peel and mince the ginger. 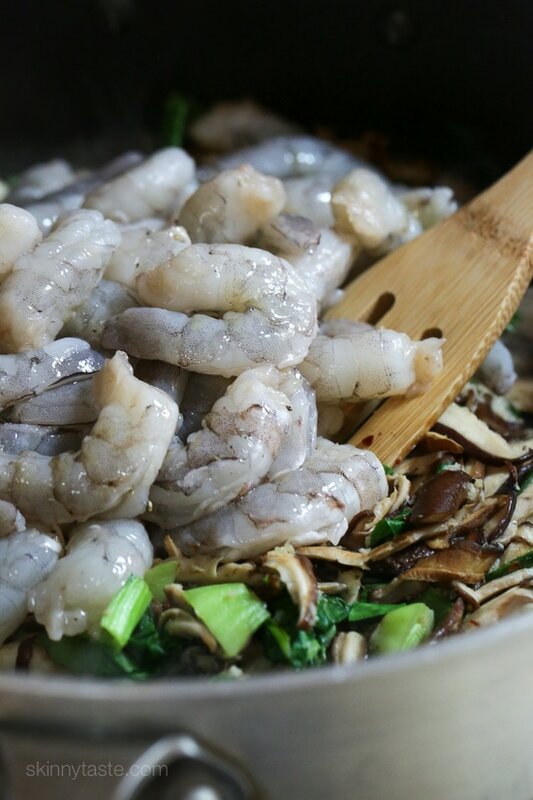 In a small bowl, whisk together the stock, cornstarch, and mirin. In a large nonstick pan, heat the sesame oil over medium-high heat until shimmering. 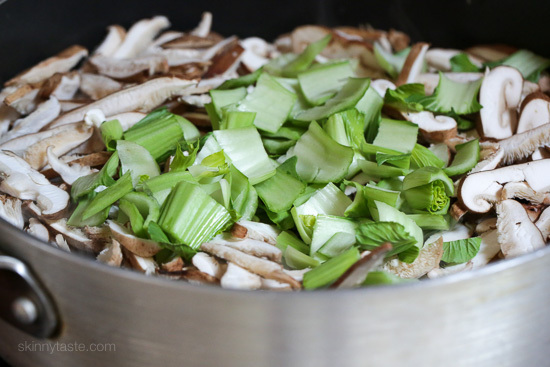 Add the bok choy stalks and shiitakes, spreading into a single layer. Season with 1/2 teaspoon salt and pepper. Cook without moving until starting to brown on the bottom, 2 to 3 minutes. Stir and cook until softening, 2 to 3 minutes. Add the crushed red pepper, garlic, ginger, and bok choy leaves and stir to combine. Cook until fragrant, about 1 minute. Season the shrimp on both sides with 1/2 teaspoon salt and pepper. Add to the vegetables and cook until just pink, 1 to 2 minutes per side. Push all the ingredients to the outer edges of the pan. Pour the stock mixture into the center, and simmer until thickened, about 2 minutes. Stir everything together to combine and coat, then remove the pan from the heat. 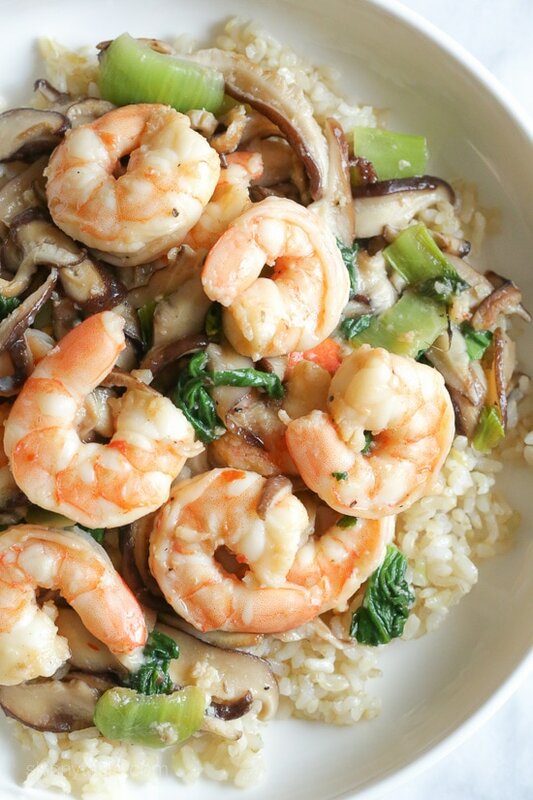 Taste the stir-fry and add salt and pepper as needed. Serve over rice if desired (not included in nutritional information). *For whole30 or paleo replace cornstarch witharrowroot powder, and mirin with rice vinegar.